After a slight intermission for Postings of the 1448 Gallery exhibit, the Monday’s posting will now return to the 12 + 12, 12 x 12’s project. After over two years of Monday postings, these are the final two paintings in the project. From the + 12 portion of this project, the ‘Doodles’ for this painting were selected by Jesse, one of my two sons. My other son, Eric, had chosen ‘doodles’ for painting #12. Jesse’s first choice was the doodle circled as #1. 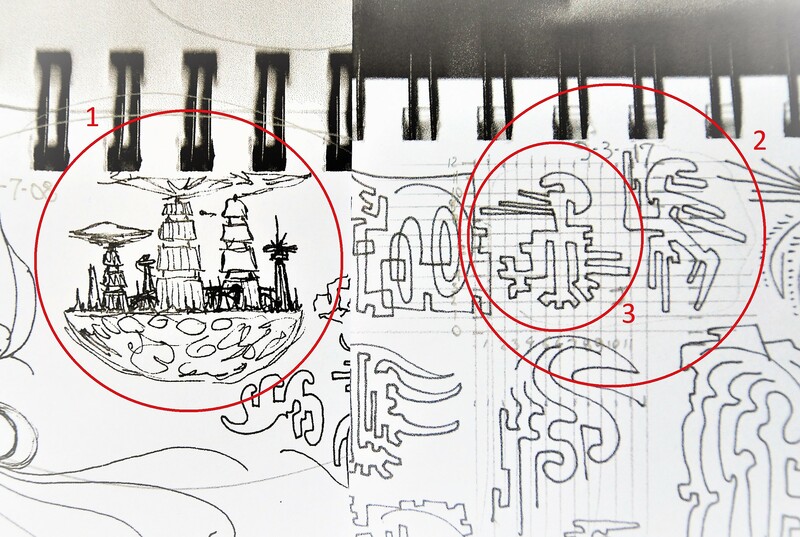 Not satisfied with this doodle as the main subject, I selected, from another of his choices circled as #2, the one to the left circled as #3 to play the main subject/design role.